This is the perfect appetizer for any holiday entertaining party. 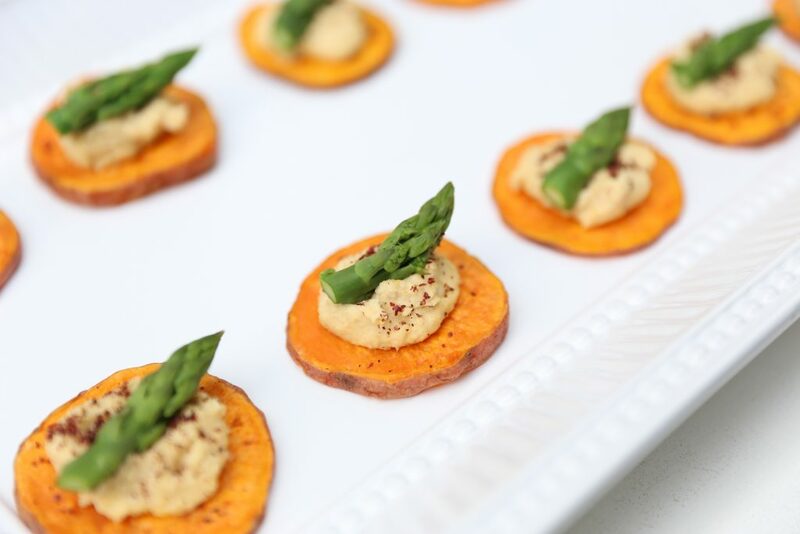 Yams are high in beta carotene and potassium, and when paired with this homemade hummus that is high in fibre, it becomes the perfect guilt-free starter. Wash the yam well and slice into disc shapes. Place the discs into a mixing bowl and toss in the olive oil and salt. Line a baking sheet with some parchment paper and place each disc onto the sheet. Bake for 15–20 minutes at 425° F.
Meanwhile, make the hummus. Place all of the hummus ingredients into a high powered blender and blend until smooth. Pour hummus into a bowl and set aside. Lightly steam a small bundle of asparagus and drain from the water. Cut the tops off and set aside. When the discs are fully cooked, allow them to cool slightly. Place one teaspoon of hummus onto each yam disc and add a pinch of sumac to each one. Top with the asparagus and serve.